What Do Sea Sponges Look Like? Sea sponges are plantlike in appearance; they develop into a variety of colors and shapes. Sea sponges lack brains or central nervous systems. However, they are classified as animals and are considered the most primitive animals in the sea. Sea sponges attach themselves to permanent structures close to the ocean floor. Coral reefs are a common place to find sea sponges. Giant barrel sponges can be found in a variety of colors, including rose-purple, brown, red-brown and gray. The cup-shaped sponge can grow to about 6 feet, with the center cavity being half the height of the sponge -- large enough to fit a squatting person inside it. The exterior is stone hard, jagged, pitted and rough. Giant barrel sponges have a brittle consistency and easily break. Tube sponges are commonly found on coral reefs, frequently seen joined at the base with bunches of tubes extending upward from the base. The elegant tubular branches are turned inward at the top and have translucent tips. 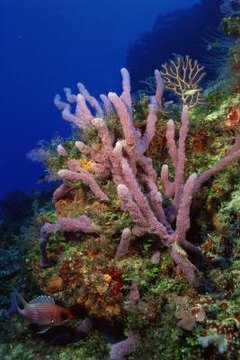 Common colors of the tube sponge are pink-violet, purple, gray, gray-green and blue. Tube sponges are capable of growing to about 6 feet tall and can survive for more than 100 years. Orange elephant ear sponges are vibrant red-orange on the exterior and paler orange on the inside. The sponge is massive, capable of growing up to 6 feet. Orange elephant ear sponges are commonly attached to coral reefs. They rise from narrow bases into a wide shapes resembling those of human ears. Several fronds are contorted with rounded margins. Orange elephant ear sponges are covered in depressions and bumps with rough, firm, spongy consistency. The yellow tube sponge has fluorescent pigments in his tissue, giving him a vibrant yellow color. When inhabiting shallow waters, the sponge takes on a cactus shape. Deeper waters allow the yellow tube sponge to develop into long straight tubes, giving the creature the appearance of a hollow, chimneylike appearance. A yellow tube sponge may reach more than 24 inches in height. Red tree sponges grow to about 8 inches in height. Typical coloring is vibrant red, but at times the tone can be red-orange. Red tree sponges are shaped like trees, with several branches extending from a main trunk. Red tree sponges are found submerged in shallow or deep water, attached at their bases to rocks. Red tree sponges grow horizontally from the rock. They are frequently used in home aquariums due to their unique color and shape.